For the millions of Americans with underfunded retirement accounts, active management may provide an essential safety net. What is a financial advisor to do when his clients are woefully underfunded for retirement based on traditional measures? When limiting withdrawals to 4% or less is essentially a prescription for poverty? For underfunded portfolios, there is nothing more essential than effective active management. Even for investors with better-funded retirement plans, active management can provide greater financial peace of mind. When withdrawals are required for the necessities of life and there is limited ability to rebuild portfolios outside of a rising market, reducing drawdowns has tremendous benefits for portfolios of all sizes. Imagine an individual with $500,000 in retirement savings. A 4% annual withdrawal rate comes to $1,667 per month. Add in the average 2017 Social Security payment of $1,360 and the individual has a potential income of $3,000 per month or $36,000 annually before taxes. Taxes will be required on tax-deferred retirement plan withdrawals, and state and federal income taxes could impact Social Security payments. As a result, the retiree might end up with less than $2,500 available to spend per month. That needs to cover insurance for health, auto, home, and any forms of life insurance; property, automobile, and sales taxes; medical copays; utilities; food and personal expenses; housing costs; and so on. Even if 4% is the widely accepted amount it might be safe to withdraw from a portfolio, the odds are that the retiree is going to need more. One potential way to increase the return on savings is to increase the risk of investing with a greater equity allocation. But higher returns come with considerable risk. Bonds are under pressure from rising interest rates, and the stock market—which has been on an uptrend over the last nine years—is considered by many to be in overvalued territory. While the long-term trend of the market has historically been to the upside, it is very difficult for a retiree to recover from a market decline if the individual also needs to be making withdrawals from the portfolio to meet living expenses. The drag from withdrawing funds from a retirement portfolio can quickly turn a market downturn into retirement shortfall. It’s all a matter of math. If your portfolio declines by 40%, it takes a 67% gain to return to its prior high. Add in the drag of steady withdrawals and recovering becomes even more difficult. An investment of $500,000 in the S&P 500 Index at the beginning of 2005 would be worth in excess of $1.1 million by the end of 2017. If an individual retired in 2005 and withdrew $2,640 each month (about 6% on an annualized basis of the starting portfolio balance)—for a monthly income including Social Security of $4,000 before taxes—by 2017 the portfolio value would be less than $355,000. The individual would have withdrawn $406,560 over the period, an improvement over money market or CD rates, but another bear market could easily result in the account running out of money. 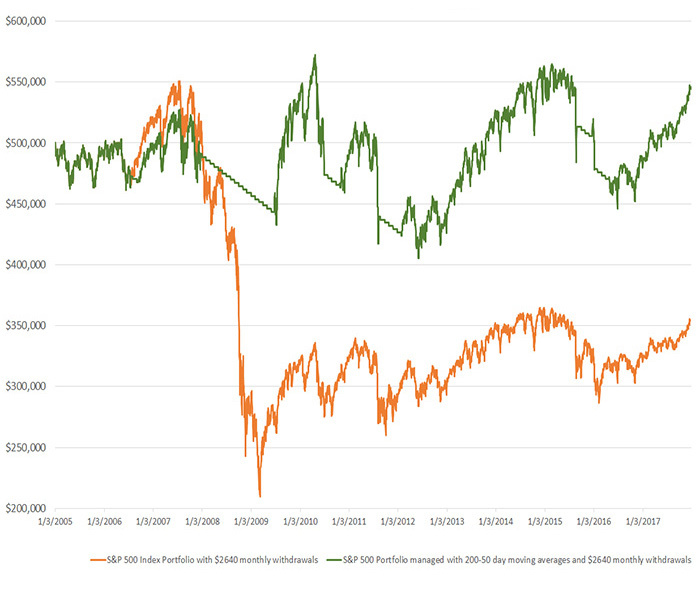 Active management has a great many different forms and levels of sophistication today, but if you were to look at one of the oldest and most widely known timing signals—the 200-day and 50-day moving average crossover—and applied those signals to the S&P 500, a very different result emerges. Using the scenario mentioned previously, by simply moving to a cash position when the S&P 500 50-day moving average falls below the 200-day moving average and then back to fully invested when the 50-day is above the 200-day, the retiree will still have withdrawn $406,560 by the end of 2017 but will have more than $544,000 in portfolio value—a modest increase over the starting value 12 years prior (Figure 1). 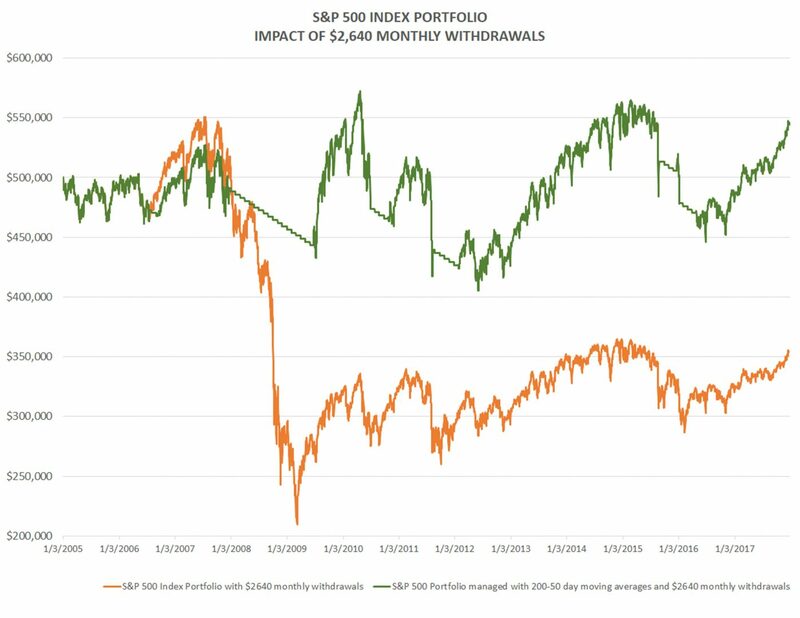 Figure 2 provides a closer look at the passive S&P 500 Index portfolio (with monthly withdrawals) versus the actively managed S&P 500 Index portfolio (with monthly withdrawals). Several periods can be seen where the actively managed portfolio went to cash, most notably during 2008–2009. How does this happen? By preserving capital in down markets, the actively managed portfolio has more to invest when markets recover, adding leverage over a buy-and-hold portfolio with the same monthly withdrawals. 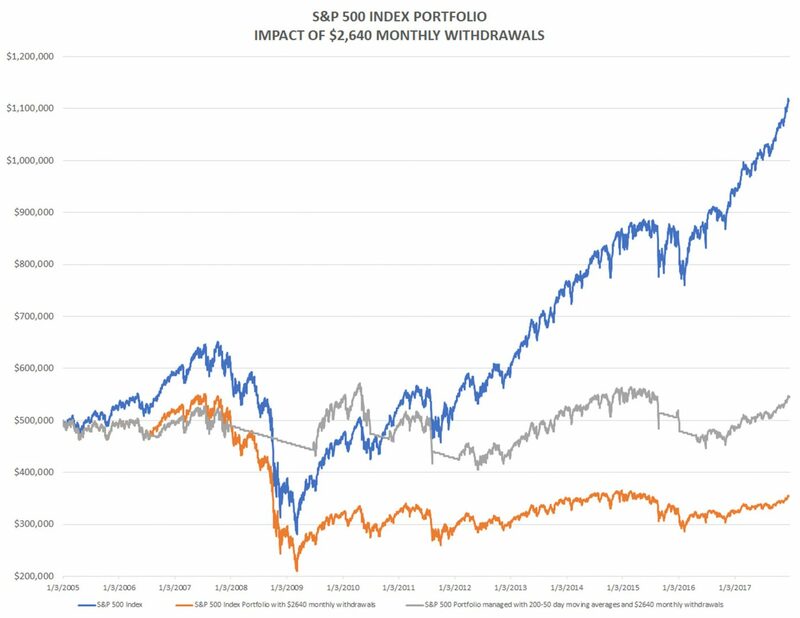 Naturally, there are several caveats to accompany these results, including that the S&P 500 is an index, and there is no way to invest directly in an index. These results are hypothetical based on index values. There is also no consideration of trading costs, management fees, or tax implications to implement the strategy. And there can be no guarantee that past performance can predict future returns. But managing the risk of down markets can clearly benefit retirees. While the ideal investment portfolio may allow the retiree to stay within a 4% withdrawal rate, the reality for many individuals is that 4% won’t meet living expenses. Adding a simple active management strategy to the portfolio that reduced the impact of market drawdowns gave the portfolio greater leverage to benefit from upturns in the market. With active management, there is room to strive for even better results. In this example, when the portfolio moved out of the market, it sat in a holding pattern, losing nothing to the market’s gyrations, but also without gains for nearly two years. 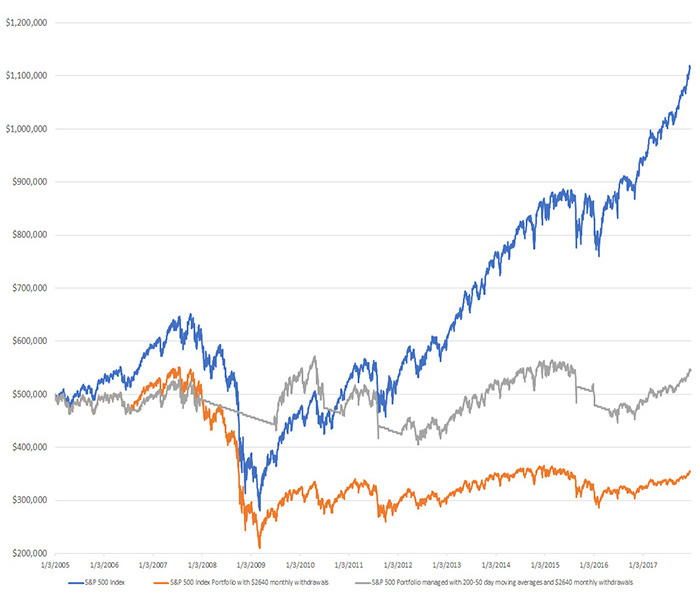 With active management, one can also consider investments other than broad market indexes such as the S&P 500, which overall returns “average” results. Leading market sectors that dramatically outperform the S&P 500 may be too volatile for a retiree without active management. Depending upon the active manager’s ability and strategies, however, there may be an opportunity to tap into some of this outperformance. Active investment strategies can also be used with bond and fixed-income portfolios to offset periods when major equity indexes are declining. For agile, experienced money managers, active management also opens up the opportunity to invest in leveraged and inverse funds. Most important for retirees, however, is managing the risk of down markets. It is always easier to lose money than it is to make money. When one is depending on retirement assets to meet living expenses, withdrawing into a declining market is the worst investment scenario. Once the funds are gone, it doesn’t matter how fast the market recovers. With less to invest, there is less opportunity to benefit from that recovery. Active management can be the retiree’s best friend. Don’t retire without it.